The motorcycle that Henry Winkler rode onscreen as Arthur “The Fonz” Fonzarelli in Happy Days is up for auction. We don’t know if it runs, but any mechanical problems can surely be fixed with a swift elbow to the fender. The bike itself is a 1949 Triumph Trophy TR5 Scrambler Custom, and it got far more screen time than Chuck Cunningham. ABC feared that Fonz’s leather jacket would mark him as a troublemaker, so producer Garry Marshall convinced the network that it was an essential piece of motorcycle safety equipment. Hence, if Fonzie were to appear on screen in full retro regalia, the bike would have to be nearby. 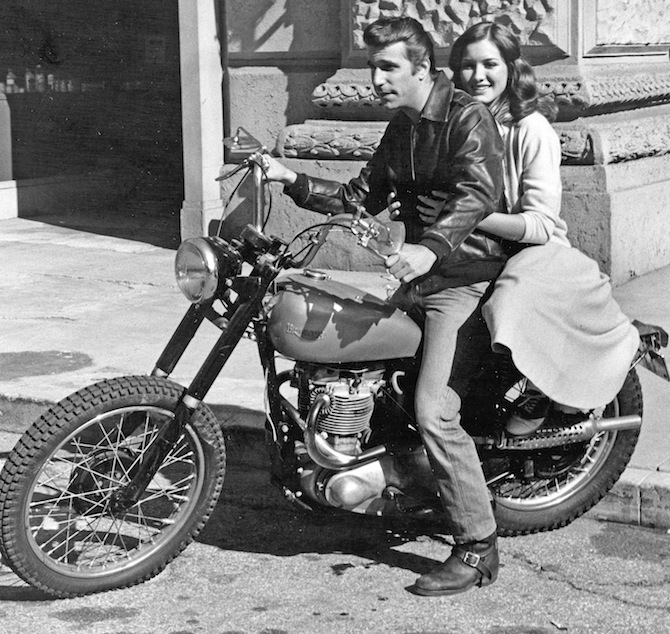 Even without the Fonz connection, the bike would have a famous pedigree since it was owned by stuntman, racer and Triumph dealer Bud Ekins — a guy even cooler than Fonzie himself. He’s best known for dying his hair blonde and performing the stunts that studios wouldn’t allow his friend Steve McQueen to do, including the fence jump at the end of The Great Escape and some of the driving in Bullitt. When Happy Days needed an authentic bike for Fonzie, Ekins obliged by removing the bike’s front fender, spray-painting the gas tank silver and replacing the handlebars. That’s how the bike looks today. If you’re interested, it’ll be up for bid at Bonham’s Classic California Sale, held November 12th at the Petersen Automotive Museum in Los Angeles. The auction does come with a few odd caveats: Interested parties can only bid by giving the “thumbs up” sign, and the winning bidder will have to sign all the relevant paperwork in a men’s bathroom.